Guelph Nissan | Blog | Guelph Nissan visits Canadian Tire Motorsport Park to cheer on Brian Makse! Guelph Nissan visits Canadian Tire Motorsport Park to cheer on Brian Makse! 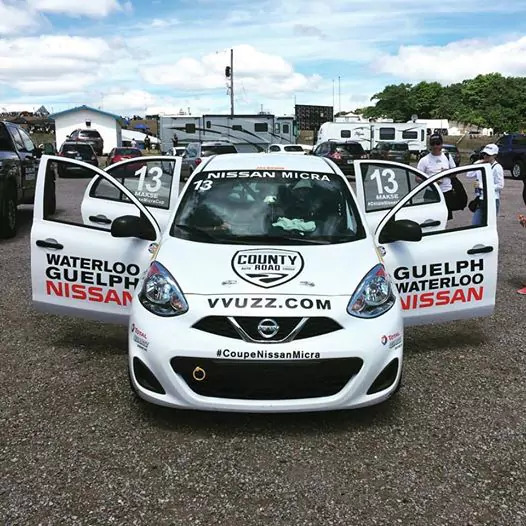 The Guelph / Waterloo Nissan Micra Cup race car made its debut at the Canadian Tire Motorsport Park this weekend and we we’re on site Sunday, to cheer on Brian Makse and the #13 Guelph/Waterloo Nissan County Road Auto Group Micra. First, if you have never been to the Canadian Tire Motorsport Park, believe me when I say, you have to go! And luckily for you, when the Micra Cup returns in September, we will make sure you have a chance to score some tickets to the weekend’s events. With that out of the way, lets focus on the Micra Cup Race. The Day started with Brian and his team arriving and getting the car prepped for the big race. Checking tire pressures, torqueing the wheels, making sure the Micra was in top running condition for the day. After he was satisfied with the car, it was time to make his way to the top of the paddock for an autograph session with all the Micra Cup drivers. Brian brought out lots of fans who complemented him on his driving skill after having watched the video from Calabogie of the crash a few weeks back. After having a blast taking photos and signing autographs, it was time to get serious and get ready for the race. We made out way down from the stands to visit Brian in the Paddock and wish him luck. Jean-Luc our General Manager asked Brian what his goal for the day was. Brian quipted back “We’re going for top ten today!” After letting the car warm up and hearing our words of encouragement, Brian revved the engine a few times and he was off to the races – literally. Brian started the race in 18th place. Quickly moving his way up the ladder to 12th. Fighting to keep his lead for the majority of the race, Brian was holding off the other drivers very well. Until, on one of the last laps of the race, right after the long Mario Andretti Straightway and heading into corner 8, he was bumped off the track losing multiple positions. He was unable to come back after that and ended up finishing in 19th place. When the race was finished, Joann Villeneuve, Famous Canadian F1 racing driver Gilles Villeneuve ‘s wife and Jacques Villeneuve’s Mother was on hand to award the Micra Cup race winners they’re trophies. The winners took the podium and celebrated with spraying the champagne into the crowd and amongst themselves.